What makes a great leader? Well, there are tons of brilliant leadership books out there that could give you great insight. But how do you know if you are on track or have what it takes to become a great leader? One way to find out is to take a leadership assessment. Never heard about leadership assessment before? Don’t fret. Because I have put together a quick overview of common leadership tests that you might encounter, plus some tips to help you maximise your leadership potential and make your life a little stressful. Whether it is to help you get into that dream leadership position, improve your job prospects or as a personal challenge, do read on and get ready to ace your next leadership assessment! It is best to prepare for this challenge, even if you are adaptable, curious, focused, tolerant of diversity in thought and ethnicity, and able to work well regardless of the uncertainty of job parameters, which means that chances are good you will achieve a high rating on the leadership potential assessment. When answering test questions, keep the learning agility focus in mind. If you are adaptable, curious, focused, tolerant of diversity in thought and ethnicity, and able to work well regardless of the uncertainty of job parameters, then chances are good you will achieve a high rating on the leadership potential assessment. When answering test questions, keep the learning agility focus in mind. Preparing for Korn Ferry Leadership Assessment Test. The Korn Ferry assessment of leadership potential test questions look at how you would evaluate your career to date. Using three types of questions (strength sort, weakness sort, and word pairs), this test aims to assess your leadership style. Given Korn Ferry’s focus on leadership and leadership styles, doing well on this test is crucial in any Korn Ferry-led recruitment process. 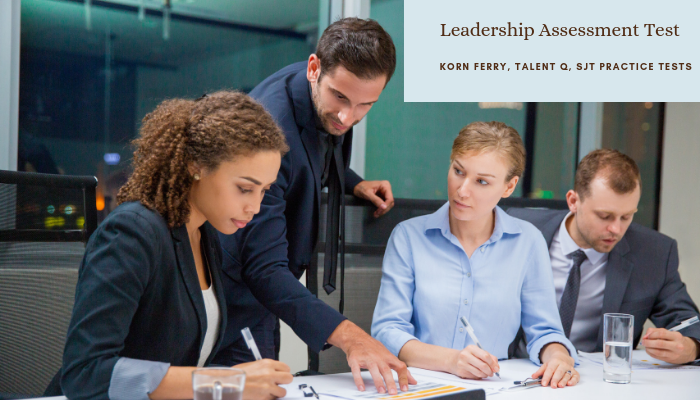 Prepare for the Korn Ferry leadership assessment with JobTestPrep’s personality and situational judgement practice tests. Talent Q is a global assessment company and part of the Korn Ferry Hay Group. In the past few years, Talent Q’s aptitude tests have become an increasingly popular job assessment tool. Their aptitude tests are divided into three types of assessments: numerical, verbal, and logical. It is important to note that Talent Q’s tests differ from other common psychometric tests in that they are adaptable. This means that depending on whether your response to a question is correct or incorrect, the system presents you with a subsequent question of either greater or lesser difficulty until your appropriate difficulty level is found. You can expect to take these tests if you are applying for a supervisor, manager, or any other high-level position. Practising on sample tests has been found to decrease exam anxiety and increase accuracy and speed. Knowing what to expect before you begin your actual Korn Ferry leadership exam goes a long way toward optimizing your test results. Start preparing for the Korn Ferry Leadership Assessment HERE. Fill in this form for JobTestPrep’s support team to contact you and advise you surely buy the correct Practice pack for your needs. This is always the first step that I take to prepare for any kind of test, including leadership assessment. Why? Because knowing what to expect during the assessment is already half the battle won. Therefore, here is what I always aim to find out before taking the test. I must say there were occasions that I can’t find much information about the test format or types of questions via the test provider’s website. But hey, Google was there to save me and it may be your savior as well because there are always people who posted some interesting insights on their personal blog or online forums. Online practice tests are the best way to demonstrate to yourself what you know and what you don’t know. You’ll then know what to expect, what you should pay attention to and how to manage your time better. Also, I personally love saving one practice test until two or three days before the actual assessment for a timed mock test or a role-play interview. These timed practices have always been the best opportunities for me to fail and learn from my mistakes without any consequences. You want to be as fresh as possible and able to fully engage your memory and thinking process when you take the test. Therefore, having sufficient sleep is key for a successful leadership assessment. I always feel some anxiety before any kind of assessment, so some tossing and turning on the bed is somewhat unavoidable the night before the test. So what to do? For me, a warm shower, 10-minute meditation and then some relaxing music from YouTube will do the trick. But just do whatever works for you because your brain would need adequate downtime to recharge and refresh. If you are taking the test from your home, do remember to turn off all notifications from IM, social media and email. Set your phone to silent mode. Let your roommates or family know that you’ll be taking a test so that they’re less likely to interrupt you during that time. If the test will be available for several hours or even a few days, don’t rush to take the test. Instead, choose a time that presents the least potential for distraction, interruption, and stress because those could directly affect your performance. Avoid last-minute problems! Check that your laptop or computer has all the correct software well in advance of the exam. I once made a mistake of using my work laptop to take an online assessment. My work laptop didn’t allow certain software installation, so I ended up wasting money to reschedule the test. Also, make sure you are in a location with an adequate Internet connection before you’re ready to start. Take a look around your work area where you are taking the test to ensure no prohibited materials or restricted items are lying around. If permitted, always keep a few pieces of paper, a pen, a pencil and a calculator on your work area just in case you need to scribble some notes or do some calculations. Once you’re logged in, take a few seconds to take a deep breath to relax and get focused. Read the instructions provided carefully. If the assessment system provides you with some final practice questions, don’t skip them because they are meant to guide you through basic navigation of the assessment system so that you can go on and proceed with the actual assessment smoothly. Once the test begins, keep an eye on the clock and go for it. We all know how daunting an assessment can be. Given the importance of leadership roles in every organisation, leadership assessments are never meant to be easy. But that doesn’t mean we can’t nail it. While there are no hard and fast rules that can be universally applied to all leadership assessments, following the tips laid out above will help you to approach the test in a relaxed and focused frame of mind. To those who are preparing for a leadership assessment or any other kind of test, don’t stress, do your best and forget the rest. Best of luck! Korn Ferry and other trademarks are the property of their respective trademark holders. None of the trademark holders are affiliated with JobTestPrep or this website.